Are you feeling it too? 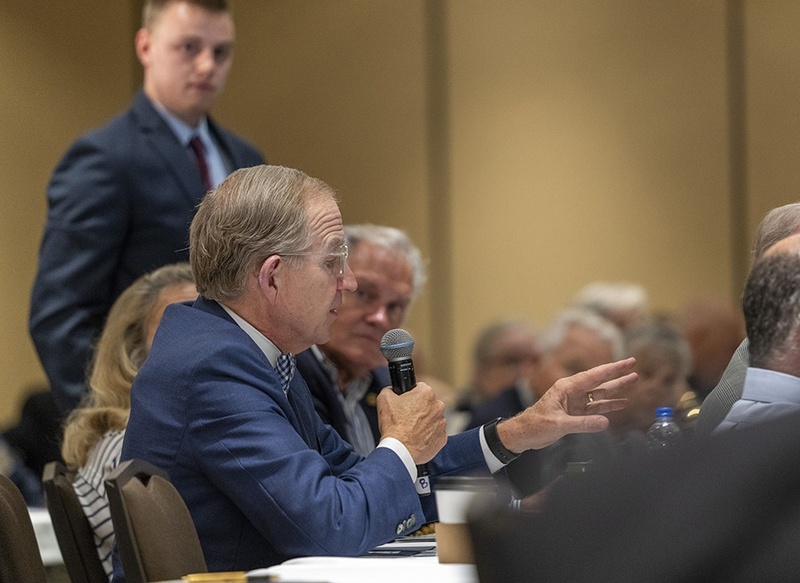 Many of us who attended last week’s Bradley Impact Conference, our marquee annual event, came away intensely energized and ready to keep the momentum going by making smart investments in conservative policy and ideas. Our panelists—all Bradley grantees—shared their thoughts on the challenges that face our communities and our country, and provided compelling insight into this year’s theme, “The Changing Fabric of American Society.” We also heard from keynote speakers Kay Coles James, Dr. Allen Guelzo, Lou Holtz, and Dennis Prager who provided thought provoking commentary on how to restore, strengthen and protect the principles that make America exceptional. We hope the conference left you feel engaged and ready to make a difference. Below is a brief overview of the panel discussions and links to the panelists and their organizations, in case you’d like to learn more. Please reach out to Jessica Dean, President of the Bradley Impact Fund, if you have further questions or would like more information. By many measures, Wisconsin is one of the freest states in country, thanks to the focus and commitment of several Bradley supported organizations. Donor support of these groups has resulted in a permanent freedom infrastructure that has been responsible for long term conservative reforms such as school choice and welfare reform. While there have been significant victories, there is still more that can be done to make Wisconsin a state that attracts investment and jobs. As the panelists listed below discussed, tax reform should be one of several priorities for the Badger state. NexGen America: Where Are the Millennials Taking Us? Millennials are now the largest generation in America’s workforce. They live in an age where people are healthier, live longer and are more prosperous than at any time in human history. How can conservatives, who share their concerns about the future, win hearts and minds? Our panel of conservative millennial leaders at Bradley-supported organizations discussed ways to more effectively engage this influential generation in our fight to protect freedom and American values. Getting more Americans into the workforce is one of the Bradley Impact Fund’s most pressing initiatives. Work is vital to a strong civil society and the well-being of individuals and families. Our panelists shared insights about strategic policy reforms and initiatives supported by the Bradley community that could effectively empower millions of Americans through the dignity of work. Many charities do good work, but how can donors discern which ones are on the ground truly making a difference in peoples’ lives? The Bradley Impact Fund can alleviate the guessing game by providing the expertise and knowledge on organizations whose work is having a permanent, positive impact on those they serve. Our final panel gave us a deeper look into what makes local philanthropy effective, why conservatives should lead the way in local charitable efforts, and how a vibrant ecosystem of small nonprofits is essential to a strong civil society. Lecture referenced by Richard Lorenc, Foundation for Economic Education during the NextGen America panel: Capitalism and Millennials, a lecture by Edward Glaeser. Thank you for joining us at this year’s Bradley Impact Conference. We look forward to sharing future opportunities for committed donors like you to advance American principles and ideals. Your passion and ongoing support for efforts to preserve freedom and promote prosperity for future generations is greatly appreciated.